Five years ago, Erang released Tome I. It was certainly a solid addition to the growing number of like-minded fantasy ambient projects emerging on the Bandcamp platform, but its creator had a much grander vision in mind. Over a dozen releases down the road finds a fully realized musical guide to The Land of Five Seasons, complete with developed characters, places and lore. 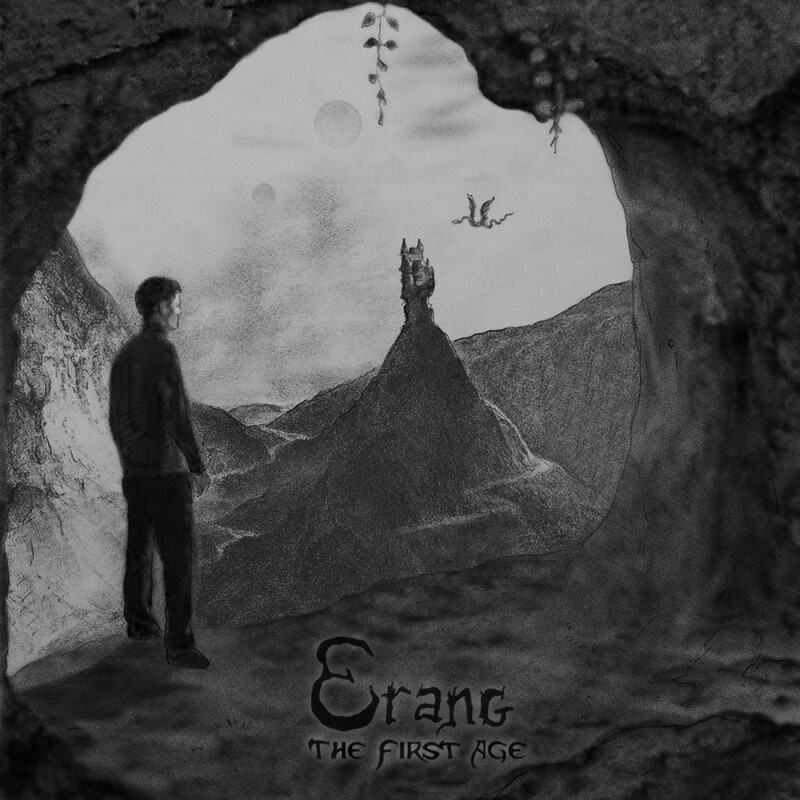 The First Age comes as both a cross section of the musical development of Erang, but also as a means of tying together a spellbinding dungeon synth narrative. “Diary of Louis Leron, year 1986… I’ve finally found the last tome, three days ago. The book was exactly what it was supposed to be… They are waiting for me now.” The album’s opening monologue emphasizes the importance of The First Age as a culmination… a definitive enlightenment about the nature of The Kingdom of Erang and its coexistence with our own world. The album’s Bandcamp page provides some clues, allowing listeners to connect the dots as they listen. After these words, “1986” soon divulges into nostalgic overload, playing every opening track in the discography of Erang in reverse from latest to earliest. While this may translate better for long-time fans, this introduction sets up some of the unique stylistic combinations this album implements. “The Last Journey of Louis Leroy” exemplifies this perfectly with its mixture of medieval and futuristic textures, bridging the gap between Erang’s ventures into synth-wave and his dungeon synth roots with surprisingly natural results. While there’s still plenty of straightforward dungeon synth tracks on The First Age, their sound has an immensity not commonly heard in this style. “All Kings Must Die” and “Everything is a Lie” feature fleshed out percussion arrangements, expertly layered moving lines and swelling production, inflating its minimalist tendencies to cinematic proportions. Even so, “a Footprint on the Sand of Time” and “Every Day is the Same” still utilize ethereal beauty akin to tabletop role-playing games, maintaining its DIY aesthetic while elaborating on its sonic potential. While “Escape of the Lonely Madman” reintroduces a recurring character in Erang’s kingdom, “The Underwater Kingdom’s Rebirth” sheds light on a mysterious realm within The Land of Five Seasons. The former’s adventurous tom-tom rhythm and heralding fanfare perfectly encapsulate a foreshadowed event Erang has alluded to throughout his discography, while the latter’s nautical dreariness gives listeners new perspective on The Underwater Kingdom. These world-building songs maintain their musical integrity as Erang uses his songwriting chops to bring his brainchild to life, but the more stand alone tracks are no less noteworthy. Erang takes contained concepts as opportunities to show off more of his technical facility and atmospheric soundscape construction. “Hunt in the Wasteland” features a triumphant melody at its center under a highly syncopated rhythm structure, but “La Nuit Noire” solidifies itself as the most technical song heard so far in Erang’s discography through neoclassical piano arpeggios. By contrast, “Birth of a Shadow” and “Through the Darkness of Future’s Past” construct spacious landscapes of shimmering tones and dower drones. Such a diverse array of auras lends The First Age to a wealth of synthetic sounds, which makes each track as unique as any of the others Erang has amassed over his impressive history. “Unmasking the Dead Oracle” encapsulates this pervading skill by using a relatively recognizable dungeon synth template to not only create a memorable song, but also to introduce a new and influential character in Erang’s musical odyssey. In fact, the closing song “Back to the First Age” stands out for being the most old-school dungeon synth cut from the record because every other track on the album treads a singular path in terms of arrangement, production and instrumentation. Erang has claimed numerous times that this latest album marks the beginning of a time of silence regarding his musical endeavors, and he couldn’t have released a better send off. Even without taking into account the quantum leap it took musically, its narrative encapsulates what has made this project one of the most enduring and beloved in modern dungeon synth. “‘The Circle is now complete, said the magician…’ ‘this is not a Circle, replied the Dead Oracle… this is a Line…’” this overarching dialogue sums up the significance of The First Age as a simultaneous completion and continuation of Erang’s musical journey. It opens as many doors as it closes — begging for further exploration in The Land of Five Seasons as much as it calls the listener to rest in epiphanic fascination.